SEMA Hall of Fame - Ed Iskenderian, 1978, Isky Racing Cams. 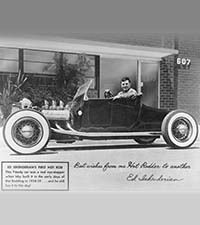 When he was a young man racing his own cars, Ed Iskenderian—or as he was later nicknamed, “Camfather”—had trouble buying racing-grind camshafts. He didn’t like to wait for them. So, he said to himself, “I can make those….” And that was the start of Iskenderian Racing Cams, popularly known as “Isky Cams,” one of the largest specialty cam grinders in America. The company developed the first high-density, chilled-iron lifters for Top Fuel dragsters, and was also responsible for the first anti-cam-walk kit for Chevy V8s and the first offset cam keys and bushings for adjusting cam timing. Ed was part of the small group that created SEMA, and was its first president. Additionally, he is a member of Chevrolet’s Legends of Performance.